I was just talking to my friend, Craig Ballantyne (also known as the “Lazy Vegetarian”) and he’s been sticking to his vegetarian meal plan. Unfortunately – in my opinion – he’s no longer vegan, but he’s doing great and he even went all the way to Europe without eating meat (but he did say he had a little bit of fish – but of course, that’s fine once in a while). He also said he’s been drinking a lot of smoothies and sent me a few of his recipes. He sure likes to experiment, so I’ll just share the best ones with you. He says this one is “safe” and not too adventurous. If it still scares you a bit, cut out the cacao nibs and walnuts. That will give you a smoother smoothie and one that even your kids would love. However, he loves the cacao nibs and says they give him a boost of mental energy, plus they go really well with the peanut butter. This one won’t look as good as the other one, but don’t worry, it tastes great (the banana is the key to making any smoothie taste great – provided you like banana of course!). You won’t taste the spinach or spirulina at all, however they both make the smoothie dark green. Let me know what you think of Craig’s smoothies. If you want more protein, add Sun Warrior protein (a great mix of vegan protein sources). And now here’s one of my favorite smoothies from the Easy Veggie Meal Plans. Add stevia (Powder or Liquid form) to taste to keep it low Glycemic. Let me know your favorite smoothie recipe in our comment’s area. My version of a smoothie would be pineapple + spinach + coconat milk (with no additives…Can you find one in US?). oh man! this look like when I was in Mexico City growing up a real treat of nutrients that will leave you with a big smile and well fed body. I am called Philipe and I live in France, is that that in your régimes you hold account of the person’s type; éctomorph, endomorph, mésomorph? Interesting smoothies – but I must say as a vegetarian for 23 years, I don’t think ‘a little bit of fish’ is ever ‘fine’. Fish are animals and vegetarians don’t eat animals. Bananas! Ugh I hate bananas (unless they’re in my homemade healthified banana-nut bread lol) and most smoothie recipes have them in it. Have you developed any smoothie recipes that don’t require them in it? I love love love almond milk for smoothies! It’s a great low-sugar “base.” I will definitely try these. Thanks for posting. Right now however, I need to lose a lot of weight and get in shape so I do not use Almond milk, but I will use it occasionally once I am back in shape! Vanilla Soy Milk to thin. About 1/2 C makes the texture and thickness we like. Adjust for personal taste. I often make them with banana for my son, keeping everything else the same. Thanks for the wonderful recipes and guidance! Sherri, you are light years ahead and it’s so wonderful to hear you are investing in your sons health by making popsicles out of the smoothie recipes. What a wonderful idea! Thank you so much for sharing. Kardena btw- you can do unsweetened almond milk so there is no added sugar. wow, you have all your bases covered in this drink. I don’t do dairy but if it works for you then go with it. This is definitely a power shake. Isn´t a bad thing to mix fat with fruits? Doesn´t ferment in your digestive system because of slower digestion due to the fat? 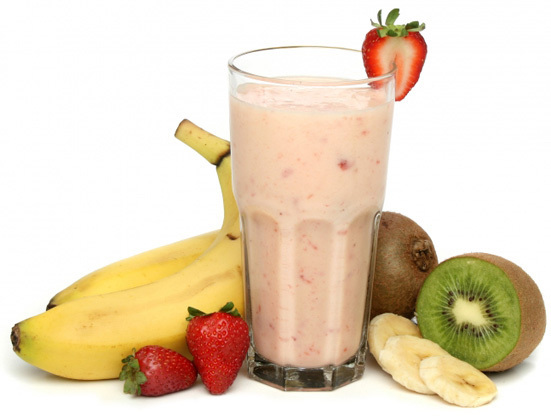 From my research you may need to be careful of mixing dairy with fruit because the fruit can curdle dairy. 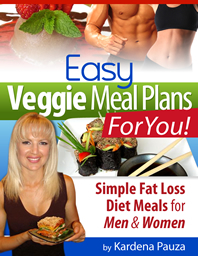 As long as you are processing and eliminating food within 24 hours. Fermentation will not take place. thanks Gudni. Ultimately, listen to your body and what is best for it. Thank you very much for your receipe. They are great and very colorful.I will try it a.s.a.p. I can. Green Smoothies rock the house! They’re a staple in my household. Yum! I just made a smoothie this morning with organic whole milk(yes it was whole but I am experimenting with metabolic eating and organic whole milk seems to do well with me less sugar then lowfat or 2% or the fat offsets the sugar), green bannana, rice protein powder, blueberries and barley greens…it acutally tasted pretty good and gave me the energy I needed without crashing and was filling enough without that too full bloated feeling. 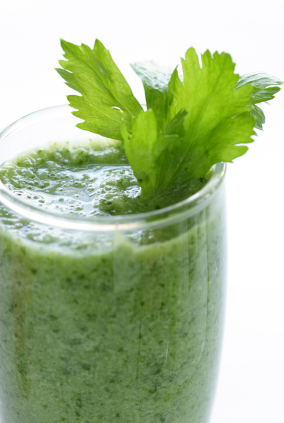 A simple green smoothie I like consists of spinach or kale, apples, and fresh lemon juice. To pump it up, I’ll add freshly ground flax seed, soy protein powder, and banana (I love bananas) and if I have them available, fresh blueberries. Oh, I forgot to mention, the liquid I use is water in all my smoothies. Extract juice from 1 apple, 1 orange, 1 pear, 2 carrots, pour into blender and blend with 3 bananas, milk and cinnamon. Absolutely delicious and lasts us the whole morning no problem! It looks good but I don’t know some of ingredients. I’m not sure if I can buy almond milk or even raw almond butter. I live in UK. I’m not sure if you have almond milk or butter either. I would check your local health food store first. If not, you can make almond milk with 1 cup almonds to 4 cups water and blend in blender. A high powered blender works the best. Then strain out the fiber and it’s ready to use and refrigerate! To make almond butter, you need a slow grinder or a champion juicer that can grind nuts also. There are other nuts you can use like pumpkin seed butter, cashew, filberts, etc. Explore a bit. I’m going to try some of these recipes – they sound delicious. One of my favorite smoothies is first to juice 2-3 apples. In the blender add 1-2 frozen bananas, 4-5 frozen strawberries and a big handful of raw spinach. Add the apple juice and blend. After blending add in 1 T. soaked salba (chia seed), 1 T. aloe vera juice, 1/2 tsp. cinnamon and 1 tsp. spirulina. With this you don’t have to worry about the detrimental effects of dairy or soy products. Somewhere in your videos or writings you listed items to add to water that included Cayenne pepper. Could you please remind me what and how on this. Thank you. I posted an article called amp your metabolism with the cayeene and otehr ingredients . Check it out for the recipe and video to go with it! I started adding some vegetables to my morning shakes based on your recommendations but I’ve been limiting the vegetables to those that are high in nutritional value and low in obvious taste so that the shake still tastes good. I love spinach, zucchini, squash of all types but I’m also glad their flavors don’t come through in the shake. Are there any other vegetables you can think of that have a neutral” flavor in a morning shake? I have found interesting veggies that taste great! Try beets (1/4-1/2) in small doses since it’s pretty powerful and great for kidney health. Carrots are great with oranges and spinach. Kind of funny but i like parsley in my breakfast smoothies sometimes. Also try cucumbers with apple and beet, yummy! What about the water? Filtered tap water, distilled, ionic? My neighbor swears by his ionic water, another friend swears by her distilled water. Does it matter what kind of water we are drinking? I am new to the vegetarian way of life and have learned a great deal from you, thank you. I have a friend who is a chemist and from his research on water and filtered water, the only way to remove all impurities is by distilling. FYI- prescription drugs do not filter out of our water unless you distill it. Then i add mineral drops or lemon back in to my water. Hi. I have been using the smoothie concept over the past week for breakfast and an evening snack and it surely seems to be showing its results. It really fills me up, and then it helps me cut down on the overdose of bread at breakfast. I’m a vegetarian otherwise as well so it seems nice. Any suggestions if I need to up the protein content on this Shake then how I should go about doing that? Also, I use sprouts of all kinds, boiled and lightly sauted veggies of all types and colours and sizes to keep my day going well! Cutting out the carbs post 7PM seems to be helping me in maintaining my day alongwith Green Tea! Your smoothie sounds so delicious. What about adding some sort of mild greens to your smoothie and maybe a little more almonds, peanuts or sesame seeds or sunflower seeds for more protein and essential fats. Maybe take a little fruit out and replace with greens maybe cucumber and seeds. You could add cardamom or cinnamon for a added treat..
fyi- the greens may help with energy too. Cacao nibs is the name for raw cocoa pieces. They are kind of chunky so instead you can buy cacao powder (raw chocolate powder). Maca is an herb from south America and is great for hormonal balance along with many other benefits. You can find of ton of information on it on the net. MAca is optional in the smoothie, it will taste great without it. But the chocolate makes everything tastes better! I like all healthy smoothies. Thanks.